Sunny Hunny01638 661997work Self-cateringWelcome to our well equipped, self catering bungalow. Despite being only 50 metres from the beach, the bungalow is in a quiet location, set back from the road, in a traffic free area. Open plane living area. Two bedrooms (double room and a second smaller bedroom with bunk beds). Shower room. 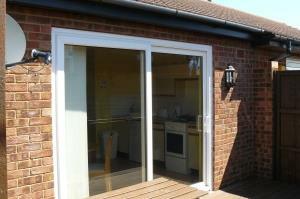 To the front of the property is a private, sunny deck with picnic table for alfresco dining. There is allocated off road parking, up to 2 well behaved dogs are welcome. Heating, electricity and bed linen are included. Tesco and the town centre are both nearby and Hunstanton provides all you need on a daily basis, whilst the historic market town of King's Lynn offers a larger shopping centre 12 miles away. The nearby beach is sandy and dogs are allowed on the South Beach all year round. There is a promenade stretching from Heacham to the red and white striped cliffs of Old Hunstanton, with its beautiful deep beach and sand dunes. The bungalow offers the ideal base from which to explore the fantastic and varied Norfolk coastline. Hunstanton is known locally as 'Sunny Hunny' because it is the only East Coast Resort to face west and enjoys beautiful sunsets. Maximum occupancy 4 people. Sorry no smoking is permitted. Please bring your own towels. Welcome to our well equipped, self catering bungalow. Despite being only 50 metres from the beach, the bungalow is in a quiet location, set back from the road, in a traffic free area. We look forward to hearing from you and we hope you enjoy your stay!